Today, it's hard to imagine a Southland without palm trees. They line the region's streets, shade its gardens, and appear in establishing shots that fix Los Angeles as a setting. But before the lanky palm conquered the L.A. skyline, another tree played the same metonymic role: the pepper. In its native Peru, indigenous South Americans found many practical uses for the tree, from firewood to medicinal applications. More than 1,000 years ago, brewers in the Wari Empire produced a spicy beer from the tree's berries. Much later, Spanish conquerors cleared entire forests of pepper trees for their timber, creating wagon wheels and posts from the wood. But in California, the pepper tree has been planted almost exclusively for ornamental purposes. According to one popular telling, the tree first took root in California around 1825 at Mission San Luis Rey. After staying as a guest at the mission, a wandering sea captain repaid the padres' hospitality with a handful of seeds, or so the story goes. The head missionary, Father Antonio Peyri, later planted the seeds in the mission garden, where a massive, gnarled specimen still grows today. We can't know whether the tale is fact or just pure legend, but by the time Californians began investing their crumbling missions with mythic significance in the 1870s, the pepper tree had become as familiar a visual trope as the padres' sandals and staffs. Above: Pepper trees shade the ground outside Mission San Gabriel, ca.1884. Courtesy of the USC Libraries – California Historical Society Collection. Above: A pepper tree as seen through the ruins of Mission San Luis Rey in San Diego County in 1900. Courtesy of the USC Libraries - California Historical Society Collection. Soon, gardeners across the state planted pepper trees to lend a romantic aura to a site. One emerged from the ground outside Santa Barbara's city hall around 1880. At about the same time, another pepper tree took root next to the mission at San Juan Capistrano. In other places, the pepper functioned as a general shade tree, planted more for its vaguely exotic appearance, tolerance of semiarid conditions, and ready availability than for its romantic associations. As early as 1858, Matthew Keller was growing 1,500 young pepper seedlings at his Los Angeles nursery. In 1861, merchant Juan Temple planted what may have been the city's first street trees, a row of peppers outside his Main Street shop. 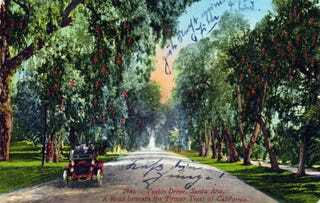 By the 1880s, pepper trees lined the signature thoroughfares of new communities across Southern California, from Ontario's Euclid Avenue to Riverside's Magnolia Avenue. (Town founder John W. North named the latter before discovering that southern magnolias cost $2 each. North opted instead to plant pepper and eucalyptus trees, priced at a more reasonable five cents each.) In Hollywood, subdivider Harvey H. Wilcox selected the pepper tree to shade his new town's roads. Pasadena boasted perhaps the most famous planting of pepper trees, whose spreading canopies created a much-photographed tunnel effect along Marengo Avenue. But the dawn of the twentieth century introduced an existential threat to the pepper tree: a parasitic insect known as black scale. Though not fatal to pepper trees themselves, black scale jeopardized the health of the vast orange groves that carpeted much of Southern California. Faced with economic ruin, citrus growers—joined by civic authorities—declared war on the pepper tree. Despite such passionate advocacy, the pepper tree soon lost its special place in the region's arboreal landscape. It fell out of favor as a street tree due to its tendency to heave sidewalks and send up suckers from its roots. And where black scale threatened citrus orchards, communities erased entire rows of peppers from their streets, in many cases replacing them with the upstart palms. Other reasons for their removal abounded. In 1913, the trees along Riverside's Magnolia Avenue fell to make way for new Pacific Electric Railway tracks. In 1931, highway widening claimed a row of historic pepper trees in Arcadia, planted nearly a half-century prior by Lucky Baldwin. And in 1955, a fungal infection forced Redlands to cut down its pepper trees. By then, the palm had already claimed the pepper's throne. Above: Pasadena's Marengo Avenue was famous for its double-planting of pepper trees. Courtesy of the Pasadena Public Library. Above: Circa 1914 postcard of Pepper Drive in the City of Orange. Courtesy of the Orange Public Library. Above: In Riverside, pepper trees (right) were planted across from eucalyptus trees. Palm trees were added later. Courtesy of the USC Libraries - California Historical Society Collection. Top image: A 1902 postcard of Tustin Drive and its well-known planting of pepper trees. Courtesy of the Santa Ana History Room Photograph Collection, Santa Ana Public Library. Southland is made possible by a partnership between Gizmodo, the USC Libraries, and the member collections of L.A. as Subject. Written by Nathan Masters, the series explores the urban past of Los Angeles, including the lost landscapes and forgotten infrastructures that continue to influence the city we know today. A version of this post previously appeared on KCET.org as "When Pepper Trees Shaded the 'Sunny Southland.'"